Seoul, Korea — “We are working hard with governments to improve transparency, governance, accountability and project delivery across the continent. Corruption does not invest in the future, it kills the future,” said Akinwumi Adesina, President of the African Development Bank, at the World Peace Summit of Global Leaders in Seoul. According to the World Economic Forum, an estimated US$116 billion a year would be required to feed the world and end hunger. It would also take US$8.5 billion a year to eliminate malaria. “That’s only 0.28% of what’s lost to corruption globally every year,” said Adesina. “It would take US$26 billion per year to send all kids in the world to school. The International Atomic Agency estimates that US$31 billion per year would provide energy for all in the world. That’s just 1% of what’s lost annually to corruption globally,” he added. The Africa Continental Free Trade Area is projected to make Africa the largest free trade zone in the world, with an estimated combined GDP of over US$3.3 trillion. 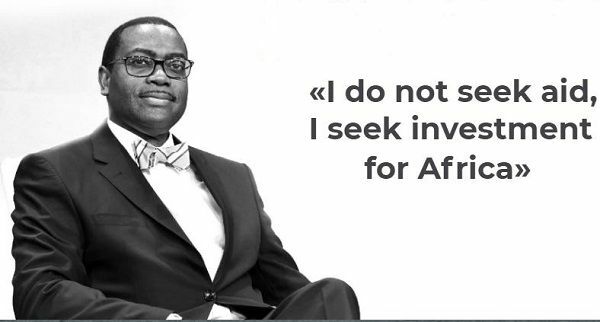 At the Peace Summit for Global Leaders, the President of the African Development Bank highlighted key achievements in 2018. These are 5 million people with new or improved electricity connections; 19 million people who have benefitted from improved agricultural technologies; 1.1 million people who have benefitted from private sector investment projects; 14 million people who received access to better transport services and 8 million with improved access to water and sanitation. Where is the Sport Commission administrator?